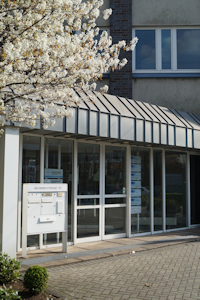 It is a technical-scientific non-profit-making society with its headquarters in Düsseldorf. Its purpose is to promote welding and allied processes for the benefit of the general public - beyond the circle of its members. It is a pacemaker in questions relating to the joining, cutting and coating of metallic and non-metallic materials as well as of composite materials. It is independent and is active in the interest of its members and for the good of the German economy. It fosters the young specialists. It sets standards for research and development, training and ongoing training, examination, certification, quality assurance, advice and assessment, technology transfer, standardisation, safety at work and health protection as well as environmental and resource protection. It is open to everybody: Natural and legal persons can be members. It offers a dense network of 74 district branches (BVs), 13 state branches (LVs) and more than 300 DVS educational facilities. It cooperates with more than 2,000 specialists in more than 200 subject-oriented working bodies of the Technical Committee (AfT). It trains more than 150,000 people per year according to uniform guidelines and more than 100,000 of these people take examinations. It organises congresses, colloquia, seminars and lecture events. It is the ideal sponsor of the international trade fair SCHWEISSEN & SCHNEIDEN, of Quality Testing International (QTI), of Structural Bonding International (SBI) as well as of other worldwide fair events. Through its "Forschungsvereinigung Schweißen und verwandte Verfahren", it ensures the practice-oriented cooperative research together with the economic and scientific fields and carries out research and development work. It has numerous advisory agencies for "technology transfer in welding technology". Via ist Publishing House DVS Media GmbH, it publishes journals, specialist books, research reports, software, guidelines and codes of practice oriented to science and practice. It monitors the correct welding technology execution of designs and structures in all sizes with its facilities as state-recognised agencies on behalf of construction supervisory authorities, testing institutes, manufacturers and similar bodies.